Lees-McRae College, located in Banner Elk, is an independent, coeducational institution affiliated with the Presbyterian Church (U.S.A.). It was founded in 1900 by Edgar Tufts as part of an Appalachian ministry of service and education. Known as the "Campus in the Clouds" (the school is 4,000 feet above sea level), Lees-McRae emphasizes personal religious values and vocational guidance that contributes to each student's welfare and growth. Tufts, a newly ordained minister in the Southern Presbyterian Church, came to Banner Elk in 1897 with the intention of founding a congregation in the remote mountains of western North Carolina. Upon his arrival he found no church, no school, and no doctor. When he died in 1923, Tuft's vision had led to the founding of a college, the 20-bed Grace Hospital, and an orphanage caring for 100 children. Tufts named his fledgling school the Elizabeth McRae Institute for Girls in honor of a dedicated teacher from South Carolina. In 1905 Tufts created a boys department and amended the name of the school to honor benefactor Mrs. S. P. Lees of Kentucky and New York. The boys and girls schools were chartered by the state in 1907 as Lees-McRae Institute. In 1914 a high school was set up; in 1927 the school became coeducational; and in 1931 the institute became Lees-McRae College, a fully accredited junior college with 225 students. The Southern Association of Colleges and Schools in 1990 granted Lees-McRae status as a senior (four-year) institution. From the beginning, the college combined the theoretical with the practical, emphasizing the training of its students in a useful occupation. In the early years there was a gristmill, a cannery, a farm, and a woodworking shop. The students built roads, laid power lines, and made furniture. They received classroom instruction in math, physics, and chemistry, which paralleled the physical labor they were doing. In the summer, the college became the Pinnacle Inn, an attractive summer resort where students learned hotel management and earned funds to pay for their schooling. By 1941 Lees-McRae had sent 40 percent of its graduates on to a university, while other graduates returned to their mountain area as agricultural experts or nurses or opened businesses. Over the years Lees-McRae expanded its curriculum to include new majors in math, computer science, and business administration. The college in the early 2000s had approximately 780 students served by 80 faculty members. The school continues to pursue its purpose of nurturing and graduating students who have developed a sense of integrity and social responsibility. "Campus in the Clouds," Reader's Digest (November 1941). 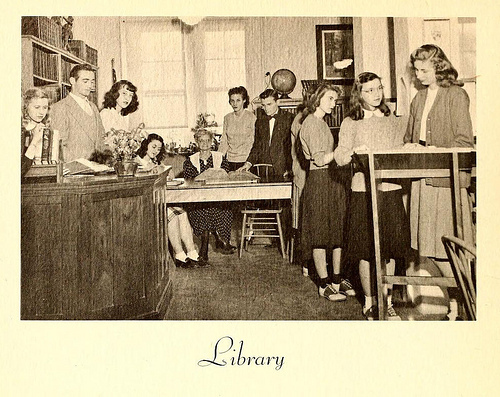 "Life Goes On in the School," Progressive Education 18 (November 1941). North Carolina Digital Collections search results for Lees-McRae. Photo of the college library at Lees-McRae College in Banner Elk, N.C., 1948. From the 1948 "Ontaroga" (p. 58). Image courtesy of the North Carolina Digital Heritage Center. Available from http://www.flickr.com/photos/digitalnc/7930253828/ (accessed November 11, 2014).